If there's one thing I dream of having someday, it's built-in bookshelves for all the books we have. We simply don't have enough room in our little place for all the ones we've accumulated, especially children's books (but oh, what a nice problem to have). This is probably why most of the time we end up checking books out from the library, so we can have a nice little stack coming and going, and can constantly change the rotation of bedtime and naptime stories. Reading to my daughter is something that has always been near and dear to my heart, so I thought it would be fun to share some of our family's recent favorites! I'm always on the lookout for gift ideas, or new books to checkout from the library each week. Hopefully this little list will inspire some of you, as well! Blueberries for Sal — My mom bought this book for Eisley, and she just loves it. "Kerplink, kerplank, kerplunk!" The story is very fun to read, showing how the relationship of the girl and her mom are mirrored in that of a mama bear and her cub. I love the illustrations and the way the story is written. I've also come across many free projects online that coordinate with this book, which are a great plus for home learning! Here's a great post with a bunch of activities I'm eager to try. Goldie Socks and the Three Libearians — This book was (somewhat unsurprisingly) recommended to us by our favorite librarian. I judged it by the cover initially (it looked a little too modern for my taste) but the story is absolutely adorable. It's a twist on the original Goldilocks tale, and features a story that will be appreciated by both parents and children alike. I'm pretty sure Eisley requested it to be read to her every night for a week! It's one I would definitely buy as a gift for another preschool-aged kiddo. To Market, to Market — I featured this book in a monthly swoonage post a while back, but it's worth mentioning again! The artwork in this book is gorgeous, and I love the way it is written. The book features the story of a boy and his mom visiting a farmers market, and as they go to each vendor the book offers a small intro on each product and the person selling it. Then, on the next page, there is a longer story that goes into greater detail of how the product is made or grown (honey, cheese, kale, etc.). This book can easily grow with a child, because you can read it to a 3 year old (sticking to the shorter descriptions) or an 8 year old (also reading the longer pages). I also find it charming that the people featured in the book are real people—actual vendors at a farmer's marker in Olympia, WA. I Took the Moon for a Walk — We received this book ages ago in a Citrus Lane box, and it remains a favorite for bedtime. If you're looking for a book that is the perfect way to end the day, this one is definitely a great choice. The illustrations are beautiful, and the story rolls off the tongue perfectly when read aloud. I also love that there is a section in the back of the book that helps teach children about nature at night: the phases of the moon, nocturnal animals, and plants that only bloom after the sun goes down. Lola at the Library — This book was a gift from Jay's mom, and Eisley has loved it since she was two! It is a great way to encourage excitement about a weekly library visit. The story is sweet, simple, and fun to read. I just discovered there are more Lola books in this series, so I'm adding them to our list to check out! Cowboy Small — We have checked this book out from the library at least three times, and I can't get enough of it. (It also gave me an excuse to teach Eisley the song Home on the Range—which she enjoys belting out randomly throughout the day.) It's a quick read with retro illustrations and a story that describes the life and times of an adorable little cowboy. It's a great book for a boy or girl (even a girl who is mildly obsessed with princesses loves a good cowboy story!). If you have any childhood favorites that you feel we shouldn't skip over, do share! 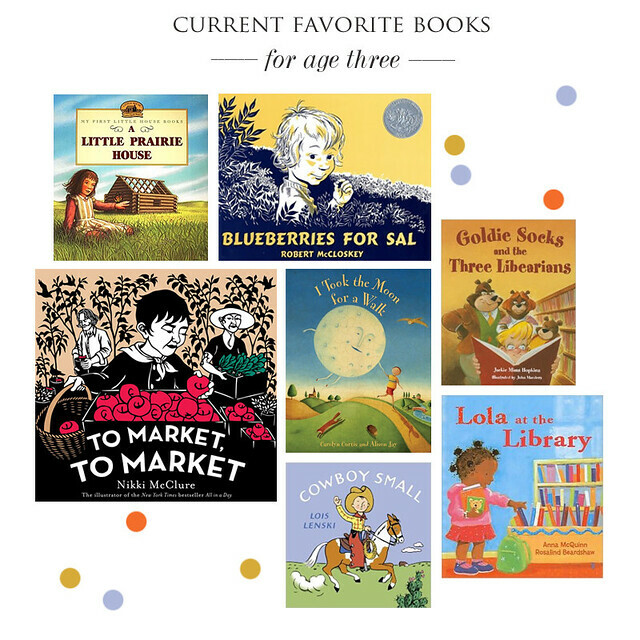 I love hearing which books people love reading with their children—or, if you don't have any kids of your own yet, you can feel free to share any books you remember fondly from your own childhood. Yay! Definitely a few to look for at our library as well as put under the tree this year! Great recommendations! I grew up with Beatrix Potter everything (sheets, curtains, etc. I still have one of the pillowcases! ), so much so that I bought the giant hard back book of all the stories for my bonus girls. They don't like it as much as I do, preferring Princess this and fairy that, but it's still there and I still manage to read a few of the stories to them when they are with us. I always loved "A Chair for my Mother" by Vera B. Williams! I've always been a big fan of Curious George! We own all three of the treasuries and most days Topher begs for at least one George story. Another of his favourite books is "The Runaway Hug" by Nick Bland.